Credit: Brent Olson/www.Shutterstock.com. All rights reserved. As a member of the Church of Jesus Christ of Latter-day Saints, I have been mourning the recent loss of approximately 3,500 brothers and sisters from our community—people who stepped away earlier this month in protest against a new policy announced by the Church. 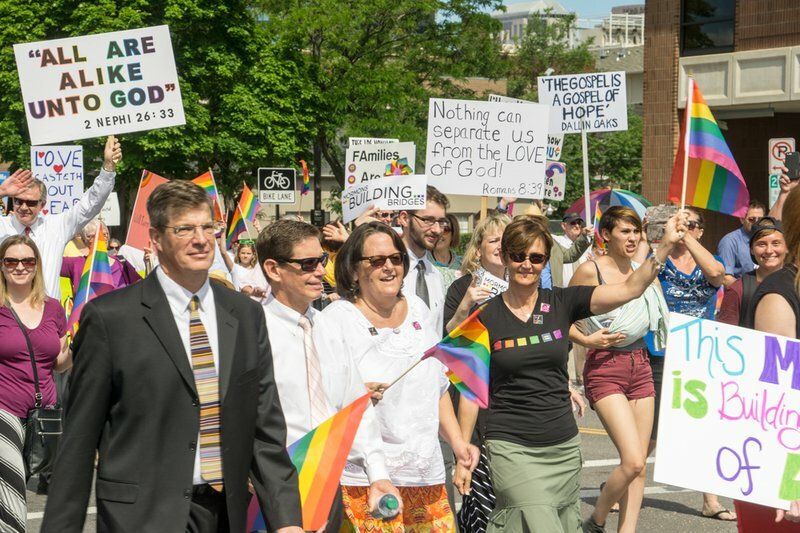 It stipulates that “adults who choose to enter into a same-gender marriage or similar relationship commit sin that warrants a Church disciplinary council.” Neither can their children be baptized as Mormons if they live in the same house as their same-gender parents. “Something is broken,” one Mormon commentator writes, “so terribly, terribly broken and I think it’s time that we named that brokenness...My hope is that we as the church will find the strength, the voice, the power and the fearlessness to claim the church back from the Upper Rooms [of the Temple – where the prophets meet]." For many people inside and outside the Church, this view is held without question—passed along as so patently true that it's hardly treated like a point of view anymore. Of course, something similar happens on the other side of the debate (that’s my side by the way), when religious conservatives place all of the blame for the conflict on ‘angry gay activists,’ as if they were hell bent on destroying religion itself out of a hatred for anyone who stands in their way. I don’t believe that. Neither do I see Mormons as monsters. Over and over, my experience has confirmed that thoughtful, good-hearted people arrive at very different conclusions about almost everything in the world, including this new policy. But this world is feeling more and more like a dystopian novel where people on all sides are pressed to see those who disagree with them as deficient human beings—as people who lack love, or faith, or both on a fundamental level. The problem with this dichotomy is that it doesn't add up—at least not for people (including me) who know loving and faith-filled people on all sides of this divide. In which case, what is going on? Welcome to what I call the ‘story wars.’ Front and center in American society, an endlessly fascinating, increasingly intense conflict is unfolding between fundamentally divergent narratives—one woven around the primacy of heterosexual marriage, and the other woven around the celebration of different forms of sexuality and relationships. If that’s what I believed was happening around the new policy on gay couples, I would come to the same conclusion. But I don't, because I don’t see identity the same way as my friends who identify as gay. Members of the Church of Jesus Christ of Latter-day Saints relish what they call the “restored gospel,” precisely for the new narrative it introduces about who we are and where humanity comes from. It’s a ‘re-storying’ of life that we embrace as a true reflection of things as they are. This includes a conception of God not as a vapor or an essence or an immensity filling all space, but as a literal Father and Mother from whom all humanity inherits a “divine potential” at the deepest level of our DNA. Even if you think Mormons are dead wrong, maybe this will help you see how hard it is for us to ‘simply accept’ the identity of non-heterosexual couples as they see it. Barring further revelation from God (which many are admittedly hoping for), doing so would essentially require tossing aside some of our own cherished beliefs about God and the family pathway to becoming like Them. It might help to share an example. Indeed, rather than mere abstractions, it’s clear that these competing stories have very practical consequences. Depending on which of them is adopted, very different things follow in real life, with potentially painful consequences for everyone involved. In a recent conversation, one Mormon mother told me about her experience in watching her married daughter experience confusion about her gender, culminating in the decision that she is male or transgender. So to me, it’s worth reframing the question like this: is it not okay to believe different things about who we are—or at least to acknowledge that fundamental disagreements about identity exist and are not going to go away? Is the sorrow expressed in these stories the result of: (a) the larger story behind the church’s embrace of heterosexual identity as eternal and fundamental; (b) the larger story supporting the identification of gay and transgender sexual orientation as fundamental to who someone is; or (c) the clash between the two? Are you loving or not? Inclusive or not? Committed to civil rights or not? Hateful or not? By moving away from these mutually-exclusive categories, another conversation might emerge about what it means to be hateful or loving or inclusive, as well as the different ways one might express faith in God and support civil rights. While core differences may never go away, my experience of this kind of conversation is that powerful insights arise that reveal fresh common ground. But don’t expect absolute agreement. If that’s the condition for community or friendship, then we’d all better brace ourselves for endless ‘story wars’ over the horizon. Mette Ivie Harrison responds to Jacob here.